I finished planting out all my bulbs for the season over the Easter Weekend but wanted to get a few more Tulip Bulbs, because tulips are my daughters favourite flower. When I look at the varieties of Tulips available to purchase overseas (both in Europe and in the USA) I am very disappointed that all that is available to us here is the standard, ordinary tulip (see update below – they seem to have just become available). Coupled with that the colour options available here are extremely limited – all the colour options appear as “sold out” on the website of South Africa’s major Bulb Provider (the company everyone seems to get their bulbs from) and yet I have not seen a single tulip bulb on sale at any of the nurseries. 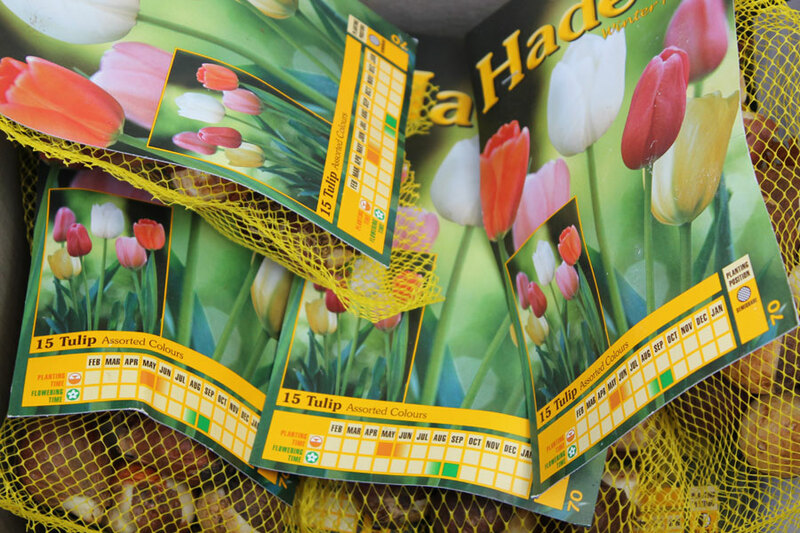 Perhaps they are still coming, I don’t know, but I only had 32 red tulip bulbs and so jumped on the “mixed” packs when the website finally had stock. 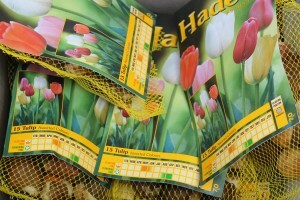 I received my delivery yesterday and now I have another 75 Tulip bulbs to plant. And, they sent me ANOTHER one of those “Free Gift Packs” … so I have another 300 bulbs to plant this weekend. 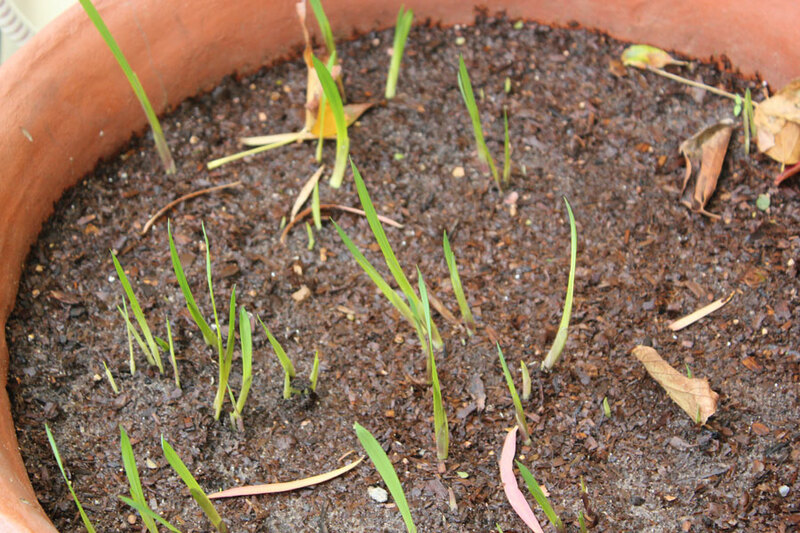 A lot of the bulbs I planted two/three weeks ago are already coming up – I have no idea whether this is normal. I was not expecting to see them so soon, but there it is. Most of them have sent up shoots and its fun to see – and at least I know they haven’t been eaten by the mole rats. 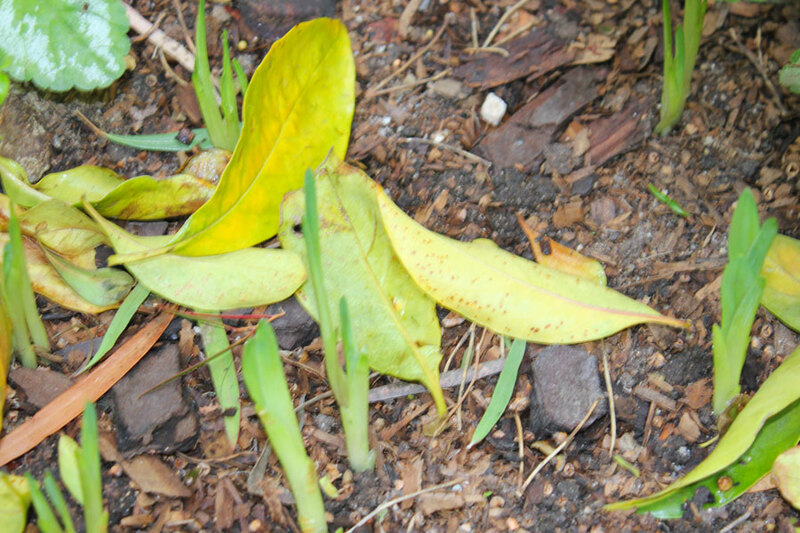 I took a few photos to share with you of my “bulb sprouts” (what is the correct terminology for this?). I’d be interested to know if it is normal for bulbs to grow so quickly. I can’t find any info in my books about how soon exactly after planting the shoots should appear. I have no idea about the tulips, I don’t grow them. I think the narcissus I inherited is also thru, and the Eucharis (Amazon lily). But most of my indigenous bulbs are showing green. For us in the western Cape, when the rain starts (or the gardener waters) they GROW! 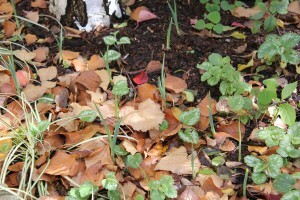 The March lilies, having flowered, muck about before they make leaves. You could do a review/interview with Hadeco?? Will your tulips be a once off? Will they flower again?? All the books I’ve read say the tulips will only flower once. I’m not expecting more from them, we will see. I do expect the others to flower again. Hi Diana – thanks so much, if your narcissus are through then I think this is probably normal. Now that I think about it, some of the bulbs had teeny green shoots already, so I suppose this is normal. also, some are supposed to flower from July, so … We will see what happens. I haven’t planted any of the tulips yet because it says to plant mid to end may, so still a few days, I will probably plant this weekend. it’s a good idea to do a review – I’ll post all my findings, and I’ve sent a mail to hadeco asking them if it’s normal for the irises to be shooting so soon after planting. Let’s see what they say. Another 300 bulbs? You’re a glutton for punishment! As to the bulb sprouts, well, here in Texas our bulbs sprout up sometimes before they’re supposed to due to it being warm here. I just leave them alone and they make it ok. One thing you have to do, though, is wait for the soil to get cold before you plant them outdoors. Our bulbs always seems to arrive right after a big freeze and I hate digging with my hands freezing! We don’t do tulips here, either, because they’re a one-time thing. Not enough cold for them, and they have to be dug up and refrigerated every year. Too much trouble for me! Not sure if that helps you. Good luck with your bulbs! Yes, I am a glutton for punishment it seems I just hope it’s all worthwhile. It’s been a fun experiment anyway. I feel a lot happier now hearing that your bulbs also pop up sometimes before they are supposed to. I think it’s our climates. I’m just going to let them “do their thing” and see what happens! Thanks Holley!! Bulb sprouts …thats funny wow, you have ANOTHER 300 bulbs …! This is going to be a magnificent show!! his is totally brag worthy! I can’t wait to see it in full bloom. Tulips are so very beautiful (next to the Dutch Iris) and you can bring spring into your home with just a simple flower arrangement. yes, I think I’m crazy, but it’s fun and hopefully it will have been worth it. Other than the tulips, all the bulbs I bought will come back next year (if I treat them right), so in the long run I think it’s worth it. I was going to say… and now you wait patiently. But then I read and saw your bulbs sprouting. Curious. We also plant in the Fall and wait til the Spring for the blooms. It’s my understanding that the bulbs need time in the dark and cold before they begin to bloom with the warmth of Spring. I know your seasons are different from mine, but I’m quite interested in why the are sprouting already. me too! But Diana says her narcissus have also come up – so I’m guessing it’s our climate. Also, some of the bulbs are supposed to start flowering in July, so maybe this is all normal. I was just not expecting this. Some of the bulbs were ‘sprouting’ in their packets already, so I guess I should not have been so surprised. And it will take some time before they grow and flower? Have a look at page 151 of “The Complete Gardening Book for Southern Africa” (the one I recommended to you), it will answer all your questions! I just checked again … it says there that the foliage will not appear above ground for at least 2 months, so you probably got hold of some special magic ones …haha!! I am sure there will be beautiful tulips everywhere when we come in November! Cant’t wait!!!!!!!!! Hi Mami – The Tulips might be over by November, but there will be LOTS of pretty flowers all over the garden come November. I can’t wait – for you to come and the blooms! You are busy with bulb planting Christine, I am sure you will have a fantastic show. 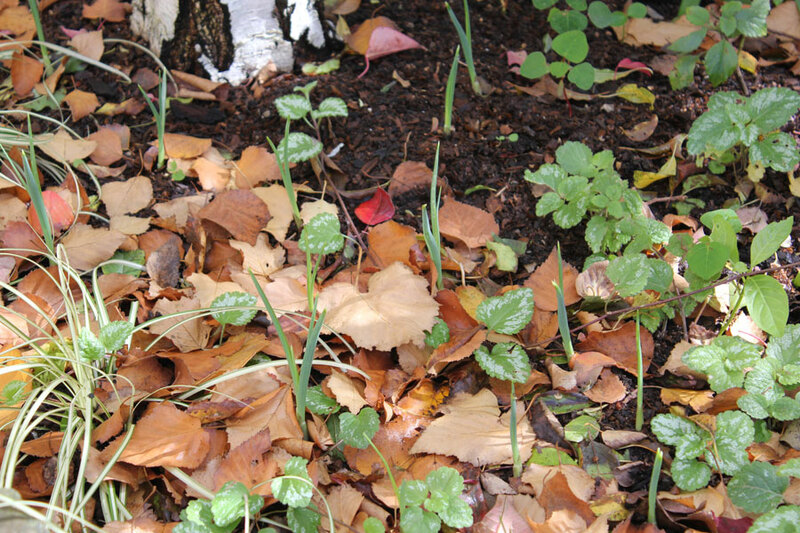 In the UK we plant spring flowering bulbs generally in early October which is the start of Autumn. We wouldn’t expect to see them pushing through the ground until 4/5 months later and be flowering between March and May. Your lack of Tulips, I wonder if it has something to do with the majority of bulbs being prepared for the northern hemisphere. I think you are correct – most of the great tulips are going to the northern hemisphere! But I get to enjoy the, via my Blotanical Friends blogs, which is nice!